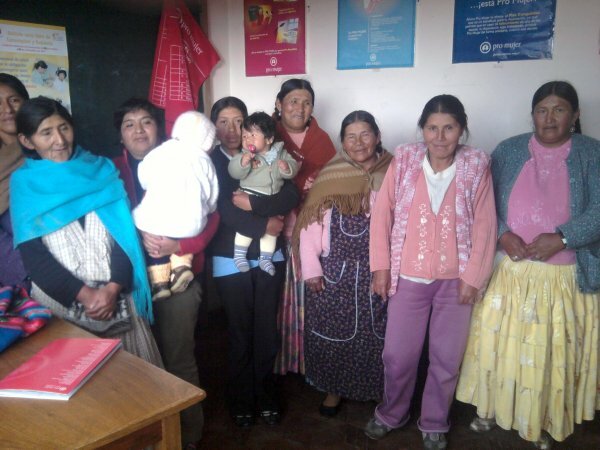 The “ALTERNATIVAS” community bank are about to start their 28th loan cycle with Pro Mujer, as part of the Los Andes regional office. The group has eight members and is run by a board of directors which is headed by Angélica. The businesses that the members of the bank are engaged in are varied and include: selling paintings, selling shakes, selling socks, selling miscellaneous goods, selling flashlights and miscellaneous goods and selling baby clothes. Angélica tells us that this is the first year she has worked with Pro Mujer. She joined through an invitation from one of her friends. She has a business selling shakes (energy products). She has been working in this business for years and learned the trade from a previous job. Angélica is taking out a loan to increase her capital, buying drinks for preparing her products. She will acquire these wholesale from her distributor and then, after preparing them, she will sell them from her sales location. This work allows her to make income with which to support her family. She is single and has two children. Congratulations to The Alternativas Group!